These mini-stick stereo microphones MS-2 are hand made with High-Quality products to ensure long life and excellent recordings! -Requires a bias voltage of 1.5 to 10 volts D.C. (also known as plug-in- power) or one of our battery modules. 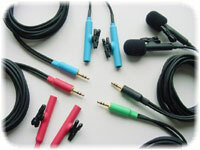 Each microphone comes with a removable, rotating holding clip (black) that can be used to attach the microphones to any convenient mounting surface. Note: If your recorder does not provide a bias voltage or if you want to feed your recorders line inputs to avoid overloading your recorder's mic pre-amplifier, you can use one of our Battery Modules.